To order from CD Baby click here - (recommended especially for credit card and overseas purchases). A wonderful compilation of songs from Christina's previously recorded cds. NEW CD RELEASE: A 2007 PARENTS' CHOICE APPROVED AWARD WINNER and includes award winning tracks by the Maryland Arts Council for Individual Music Composition 2007 about Christina's Childhood in Scotland; suitable for both children and grown - ups. Those who have heard it so far say that it is her best recording to date. This cd was recorded, produced and engineered by Scottish artist Ian Bruce in Castle Douglas, Dumfrieshire, Scotland and features some of Scotland's best musicians including Ian himself and Marc Duff, co-founder of Scotland's Number one Celtic Band "Capercaille." REVIEW BY PARENTS' CHOICE FOUNDATION: "Memories of a childhood in Scotland inspired this charming, soft-hued collection of songs from Christina Harrison, once a Glasgow bairn." Fairies in the garden, riding a double-decker bus, Robert Louis Stevenson's "Bed in the Summer" poem, a shivery, nighttime narrative, "Owls in the Wardrobe" - each song is a well-told story." 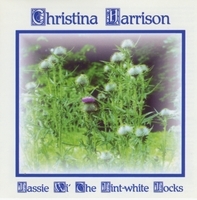 REVIEWS: LASSIE WI' THE LINT -WHITE LOCKS: Ian Bruce - Scottish artist and producer of this recording: "Christina Harrison is petite but probably has more voice and presence per cubic inch than anyone else on the planet. It was the slightest suggestion from Chris that I produce, for her, an album and record it in her native Scotland, that had me jumping in with my size elevens. I arranged a band of the finest Scots' musicians to come and do the business. When you have Tony McManus on guitar and bass, Ian Lowthian on accordion, Marc Duff on whistles, recorder, bouzouki and bodhran, Iain Fraser on fiddle and viola and Chris on vocal, you can be pretty sure that something quite special is about to emerge. My already high expectations were surpassed." RADIO TAY SCOTLAND "A delightful album of folk orientated songs. Christina has a very distinctive voice and brings a clear and bright edge to a well chosen programme. Her choice of backing musicians is first class with a number of fine solo flourishes adding to the overall quality of the album. FOLK ROOTS :U.K. "US based Scottish singer with a powerful and striking voice and some well chosen songs comes home to record with some of Scotland's finest (IanIanIan), Tony McManus, Marc Duff." THE SCOTS MAGAZINE "Christina's vocal skills take us back to the days of Mary Queen of Scots..." DIRTY LINEN "Harrison is a bright-voiced vocalist who can sound as intense or as playful as her material. Her honest and unaffected singing is backed by notable friends." REVIEW by Tom Slattery, IRISH EDITION, Philadelphia, PA. What's not to like when you take a superb voice and turn it loose on a Top 10 list of Irish and Scottish all-time favorites. You like Scottish? How about "Flower of Scotland," "Annie Laurie" "Scotland the Brave."? "Amazing Grace," along with a medley including "I Belong To Glasgow," and "The Northern Lights of Old Aberdeen"? From across the Irish Sea there is "Come By the Hills," "Danny Boy," and "Carrickfergus." Enough? Well the most beautiful song on the album is the haunting "Ae Fond Kiss." I like it, I like it. REVIEW: BONNIE RIDEOUT - Scottish Fiddler Dear Christina Harrison We wanted to write to you to express how wonderful your album is; "Wee Folk Songs." First let me say, speaking not only as a musician myself, but as a mother of three children from ages two to seven, that this album has offered me particular enjoyment. I feel somewhat of a connoisseur in this area of music now that I have had to sit through literally hundreds of listenings of children's recordings, and I still do not get tired of hearing you. This is rare indeed! But the true test of a successful children's album is how it holds the attention of the wee folk. Your music is not too difficult for the kids to learn the words - even "Treacle, Toffee, Macaroni". My girls always dance to "Doon In Egilsay St., and all join in the mandatory animal sounds that pass the test of a truly enjoyable album. I am especially grateful that your tempos are not out of control, like so much music for kids today. Your choice of tunes is perfect, and I especially like the songs you wrote. I hope you continue to do more writing and I look forward to hearing more of your work. With gratitude for making our life sweeter. Sincerely, Bonnie Rideout, Adam, Clarice, and Molly. 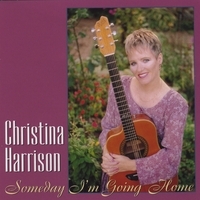 REVIEW FROM DIRTY LINEN, Baltimore: Maryland-based Christina Harrison mixes her classically trained soprano voice in songs that vary from Celtic contemporary folk and country. Her voice is as haunting as a flute. Exiles her first substantive release, is a mélange about the immigrant experience. The songs she's chosen for this album demonstrate an endearing respect for her Celtic roots, including Bob Gillman's "A Little Piece of Ireland," Eric Bogles' "Leaving the Land," Dougie MacLean's "Caledonia," Richard Thompson's "Farewell, Farewell," to Phil Coulter's "Town I Loved So Well." Harrison's voice stands out in the traditional "Month of January" and in a duet with Liam Maguire in "Skye Boat Song." "To Exiles," with lyrics by Neal Monroe and music by Harrison, elucidates the emotions of the immigrant to the traditional sounds of bagpipes, flute, piccolo, recorder and bodhran. Joining Harrison are a bevy of musicians from Scotland, Britain and Ireland. A cleanly produced album by Roger Hoilman (who adds vocals and key boards), most of the songs here are backed by bass and drums. You're apt to hear combinations of mandolin, banjo, soprano saxaphone, strings or pedal steel. The pedal steel comes into play in a country song "Don't Let the Sun Go Down Upon Your Anger," a folk ballad about expressed feelings, with a generous helping of soprano sax. The most unusual tune is "Starving Wolf With Mange," with its pounding rhythm and wind effects. Aside from its disturbing title, the song presents somber images of the eradication of Native Americans and habitat by the white man. This is Christina's first entire album of originals, with the exception of one track, "Nothing in the Soul," written by Bob Gilman. She bravely took her Scottish songs to a renouned studio in Nashville, TN where she was introduced to some of the country's best accompanying musicians such as: Steve Sheehan, Pat McNamara, Jim Hurst, Andrea Zonn - all of whom record with America's music superstars. As they charted and played on her songs she remembers experiencing goosepimples and thinking "I have finally arrived - this is the best music experience I have ever had." As if that didn't suffice, some of her songs were also graced with the Uillean pipe playing of Eric Rigler who also plays on the soundtrack of "Titanic" and "Braveheart" movies. WILMINGTON NEWS JOURNAL, DE Recorded in Nashville, the album features contributions from notable musicians, but even among such musical heavyweights, however, Harrison's voice commands center stage. REVIEW BY JAMIE O'BRIEN - IRISH EDITION, Philadelphia, PA Coming across a new album by Christina Harrison is like meeting up with an old friend. There is the warmth and familiarity you expect, but there's also something of a surprise. That is certainly true of "Someday I'm Going Home." If you're used to Christina 'the folk singer,' stand by. Harrison is a versatile singer and a good writer (most of the songs are her own). Although this is not a Celtic album in the sense her earlier work was, she does not loose touch with those roots, as songs like "Watercolors" and "The Housewife's Life's Sae boring" demonstrate." 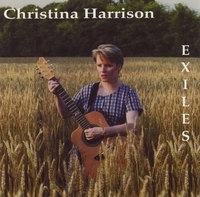 This is a collection of lyrics & guitar chords from Christina's earlier recordings: Bonnie Scotland I Adore Thee, Exiles, Wee Folk Songs and Fragments.